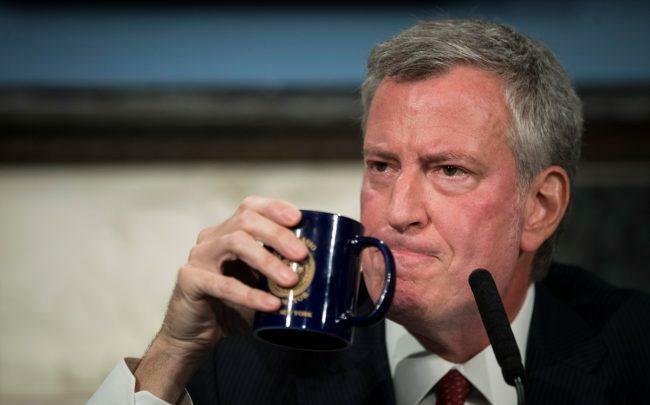 NEW YORK, Jan. 17 (Xinhua) -- New York City is entering a "full-blown" crisis as the longest-ever federal government shutdown has no end in sight, which has caused "massive effects" on people's lives, mayor Bill de Blasio said here on Thursday. The city will have no money to address the crisis if it lasts for months, said de Blasio in a press conference. "This is not a crisis that just hits and then levels off. In fact it starts to cascade." Starting from March 1 -- if the shutdown still exists by then -- the city will lose 500 million U.S. dollars in federal support every months, which will directly affect 2 million New Yorkers, the mayor warned. A series of programs of the city, including the food stamps, school breakfast and lunch, and affordable housing system, will be threatened by the shutdown, he said. "We're literally watching as the federal government starts to starve its people," lamented the mayor, as funding for the federal Supplemental Nutrition Assistance Program (SNAP) which some 1.6 million low-income citizens rely on will be cut if the shutdown continues. During his term in the past five years, the mayor said, the city has faced terror attacks, natural disasters and other challenges, and he had always told New Yorkers that "things are going to be OK."
But a government shutdown of such length and uncertainty is something the city has never experienced before. "Unfortunately, today I have to tell you that things are not OK," he said. The mayor also said his government will try its best to address the "man-made" crisis, but resources will quickly be exhausted even for a city as rich as New York due to the severity of the issue. The partial government shutdown, which was caused by a stalemate in Washington over the budget of a wall on the U.S.-Mexico border, has entered the 27th day, making some 800,000 federal workers furloughed or working without pay. There are 18,000 federal employees working in affected agencies in the New York City, according to the mayor.